Finally! This is something that probably everybody knows, but it’s been driving me crazy for years. “It” is the fact that, if you have multiple Projects open in the Timeline, sometimes they just “randomly” disappear from the Timeline History. Say I have Projects 1, 2, 3 ,4 ,5 and 6 open. I work on each, open a new one, attempt to go forward to another and… half of them are now gone from the History. Why?!?! Well… here’s why, and it’s really simple. When you open any Project, it becomes the last thing in your history. So, if you have Projects 1, 2, 3 ,4 ,5 and 6 open, are working on Project 3, and then open a new project (Project 7), Projects 4, 5, and 6 are now gone and 7 is now the last Project in the History. So, now that I know this… if I want to open a new project and keep my History intact, I just go to the last project in the History, and then open the new Project. Easy. When you open a Compound Clip from a Project Timeline, the Compound Clip becomes the last thing in your history. 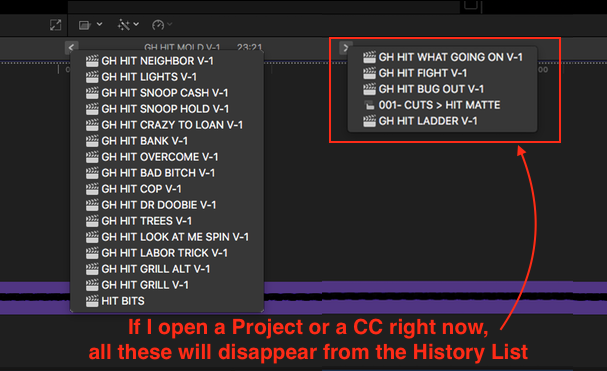 So, If I want to open a CC from Project 3, and keep 4, 5, 6, and 7 in the History, I go to the Browser and double click Project 3 which then makes it the last thing opened and moves it to the end of the History. So I now have Projects 1, 2, 4, 5, 6, 7, 3 and a CC as my history. Out of order, but all still in the History. Anyhow… hope you find this helpful, I sure did. Click Here or on the pic to check out the article.